This show has been on our list for a while now but we never got round to booking.. So Holly and I went through our list of shows that we needed to book and see and Close to You came out on top so here we are with the review.. 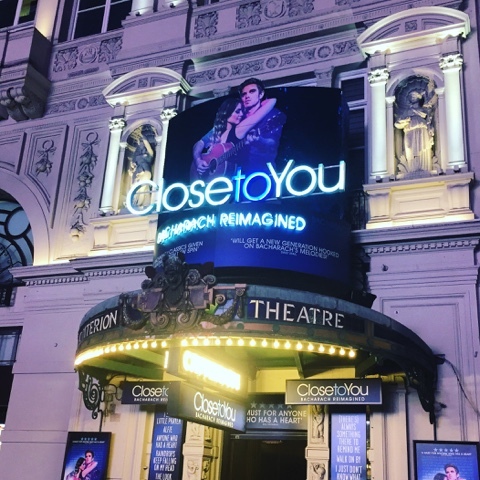 So Close to You is at the Criterion Theatre Piccadilly Circus Id never been to this theatre so was intrigued to see what it was like. We arrived at 7pm and had to collect our tickets at the box office and straight away there was a very warm welcome at the door which was nice to see. We collected our tickets and we were in Row P seats 1 & 2 these were RV but could still see the stage just had to lean in a bit to see wasn't a problem for me,there was plenty of leg room and very comfy seats which makes a change.. The theatre itself was small but i liked that as it was more of an intimate setting and feeling for the which worked well with the show. The show started at 7.30pm and my feet were tapping straight away which for me is a good sign but if i am 100% honest it took a good 20/25 minutes for me to actually get in to..The staging was simple but worked really well with show and the cast moved props around which is a great touch.. The cast were fabulous but there was 2 stand outs for me and that was Kyle Riabko & Anastasia McCleskey wow what voices these 2 had blew me right away and it takes a lot for me to feel like that. I loved that the cast played all the instruments and sung live the whole way through. Close to You has many songs that most of you would of heard of such as What's new pussycat , I say a little prayer, Anyone who has a heart , Wishin & Hopin and many many more.. I did like this show but for once i felt like i was to young to appreciate it as didn't know a lot of the songs and the ones i did know either had a rock or reggae vibe to them which I kind of liked but wish they had of kept them simple but then I suppose that would be boring so got to switch it up a bit.. This is a show my 64 year mum would love as its the music she loves so i do think it is a show for the more mature person who would of been around when these songs were big at the time..
Its a show I'm glad to say i have seen as its one that we have been wanting to see for a while so at least that one is ticked off the list. Close to You is only on for another 2 weeks so please go book a ticket and see this show before it ends. 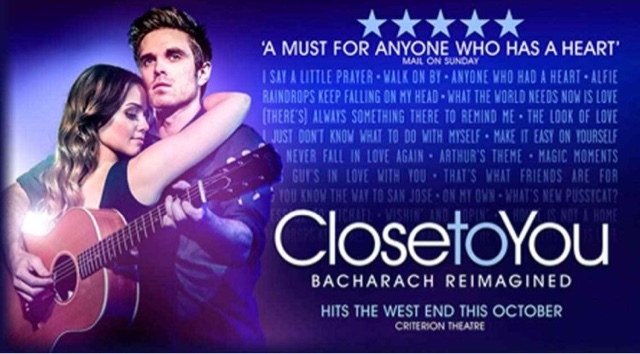 Here's my review from last nights visit to see the lovely Close To You. As Laura mentioned we sat down with a list of shoes to book a few weeks ago so I jumped at the chance for these tickets. This was also my first visit to the Criterion Theatre last night and I enjoyed every minute of it. I always love exploring a new theatre and I have to say from the moment you arrived at the door the staff were lovely and the theatre something special to look around. I'd managed to grab some tickets in the stalls and for a Restricted view they were great. One thing I thought stuck out was you could book seats on the stage to watch the show. Very clever idea making them couches as this worked brilliantly with the stage set. What I learnt last night was I knew more songs from the shows vast catalogue than I thought I would. I think I've grown up knowing different versions of these songs but the cast performed them all to a great standard. I couldn't fault any of the singers last night the clever way they performed the songs keeping the audience with them was something I really enjoyed. I have to mention also seeing them all play instruments and sing live with no backing track was something really fresh to see. If you do get a chance to grab some tickets for the last few weeks of the show you won't be disappointed and are in for an enjoyable evening.